Today we continue with last week's web log which featured "everything else," a grouping of plants that included everything besides maples and conifers. This diverse collection is the "fun" aspect to our horticultural enterprise, not that any form of plant production is without its inexplicable successes and failures. You know we have the newest and best of maple and conifer introductions, but we often surprise you with hundreds of other offerings: those trees and shrubs from the "best corners of the world." 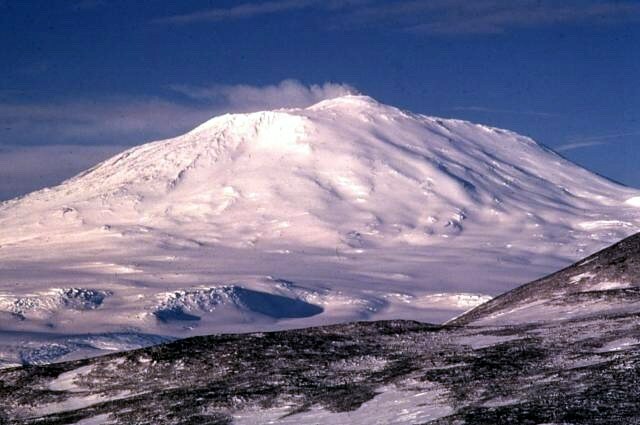 Probably though, Antarctica is not one of the best corners, for there are no trees and shrubs, and over 99% of the continent is permanently covered with snow and ice. 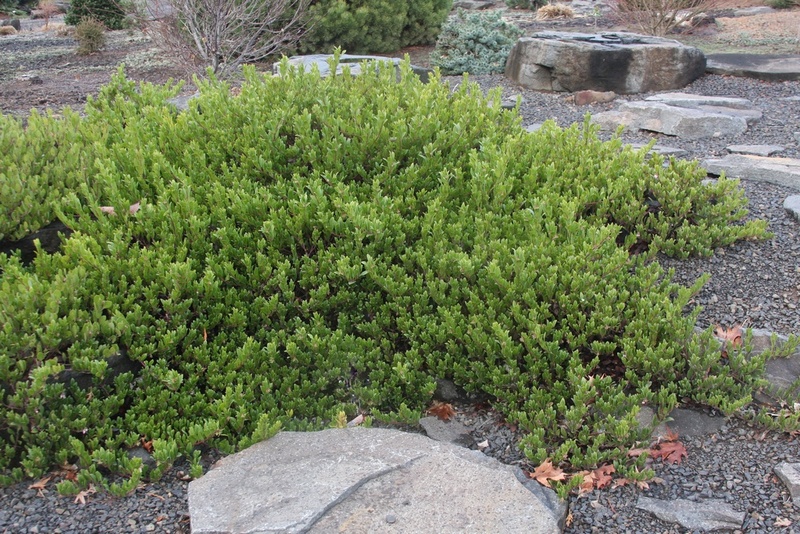 There are only two species of flowering plants: one is the "Antarctic Hair Grass," Deschampsia antarctica, which I do not grow, but the other is the "Antarctic Pearlwort," Colobanthus quitensis, which I have had for a number of years. I should mention that Antarctica does contain lower plant forms such as lichens, mosses and liverworts, just like here at the nursery. 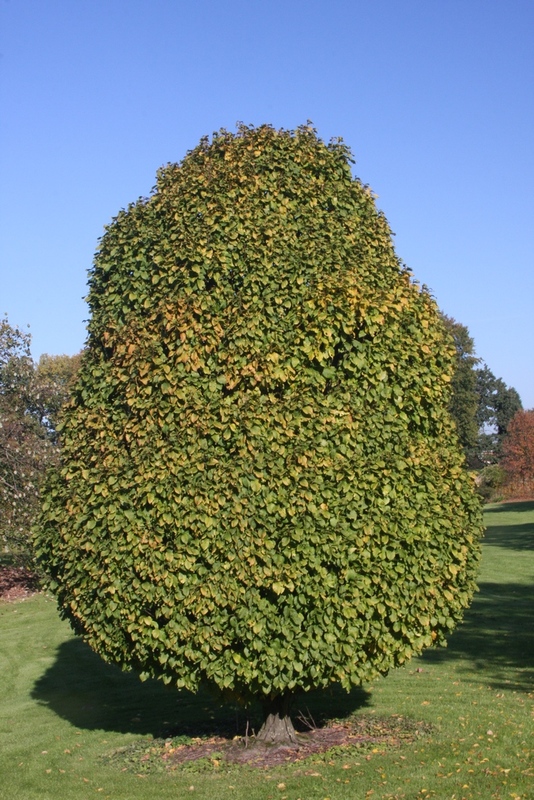 I used to employ some lower human forms at the nursery as well. 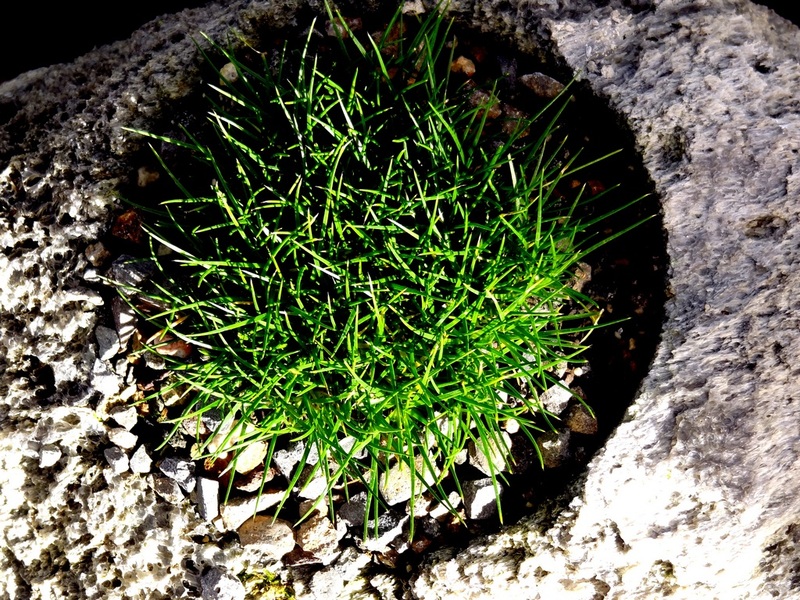 Anyway the pearlwort is cute enough, and we have begun propagating it. 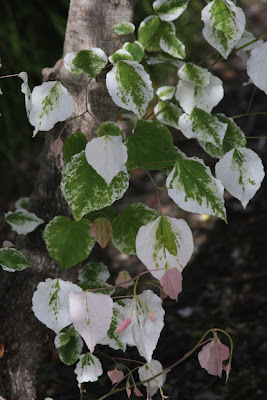 The flowers are not striking; they are diminutive white things that appear in spring. 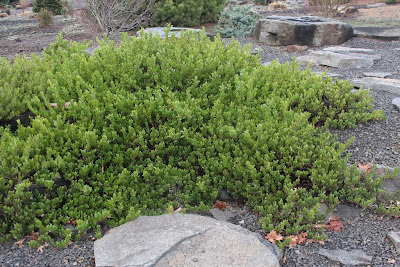 Colobanthus is a well-behaved little bun and does not seem inclined to spread out of control, and you absolutely don't have to question its winter hardiness. 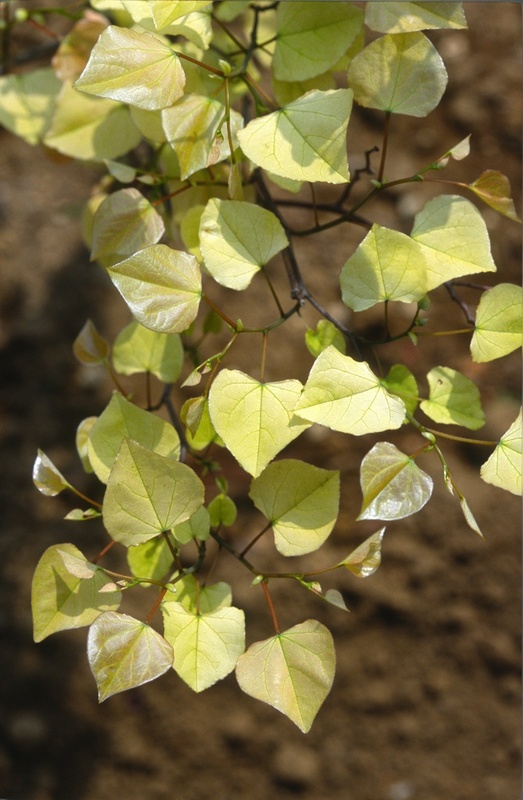 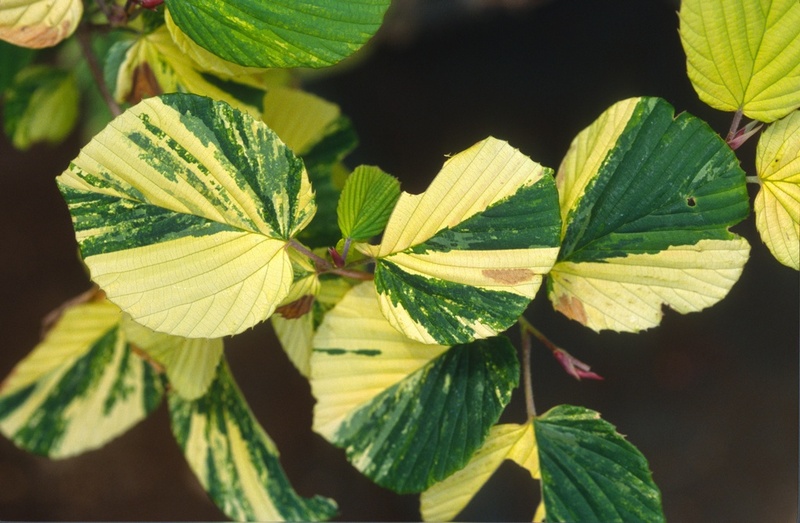 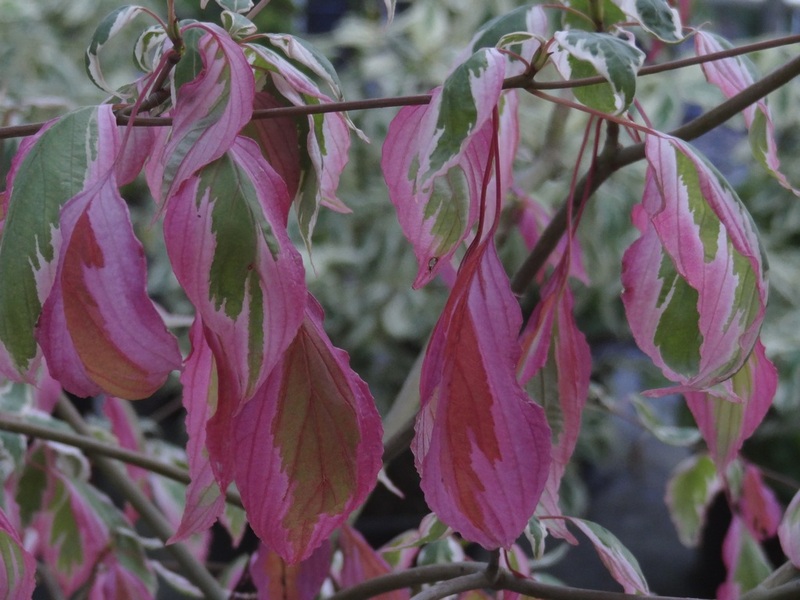 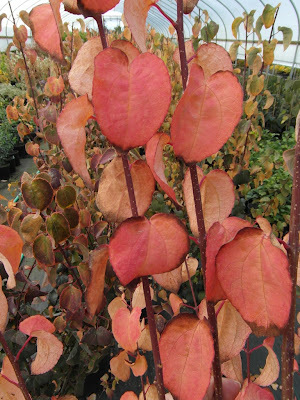 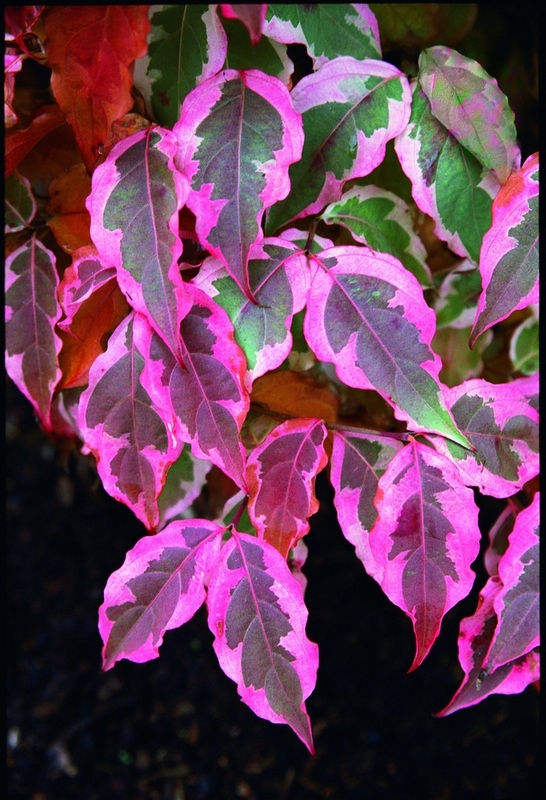 Actinidia kolomikta is an impossible-to-believe vine with amazing white and pink variegation on many of its leaves. For us it performs best with afternoon shade, and can scramble to thirty feet wide. I don't know if our clone is male or female, but I have never seen the fruits (which require a male pollenizer). 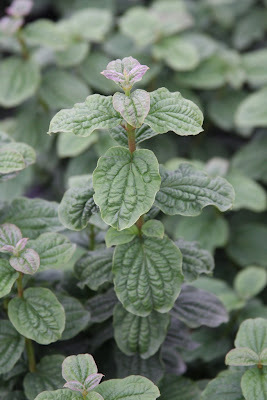 Don't think of growing this "Kiwi" if you have cats; they prefer it over catnip even. 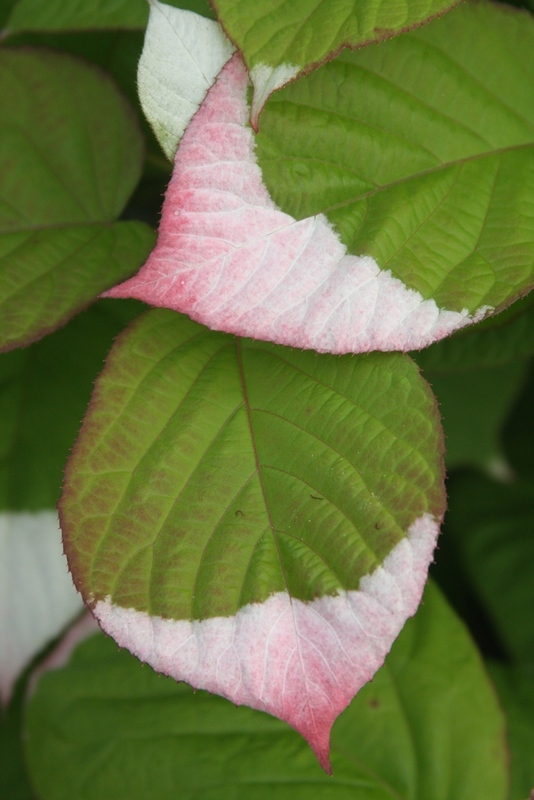 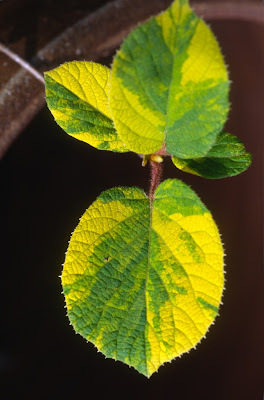 Actinidia kolomikta was introduced into cultivation by the Veitch Nurseries of England in 1878, as employee Charles Maries collected it in the northernmost Japanese island of Hokkaido. 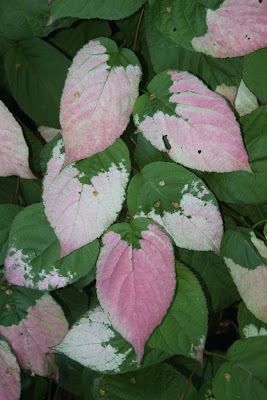 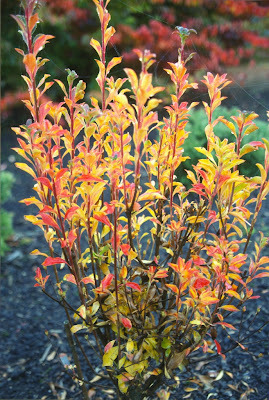 I wish to know Maries account of the discovery--was he astounded by the colorful leaves as I was when I first saw it? For the record, I saw a variegated kiwi in Japan, on a fruiting cultivar I suppose. 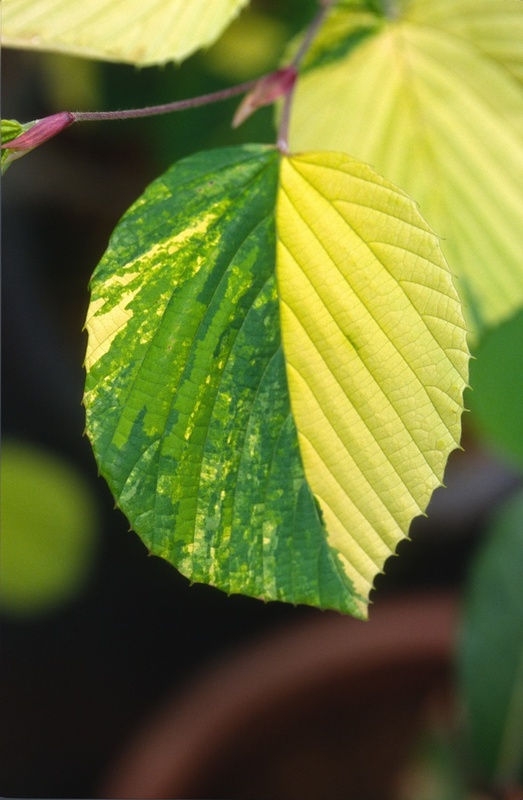 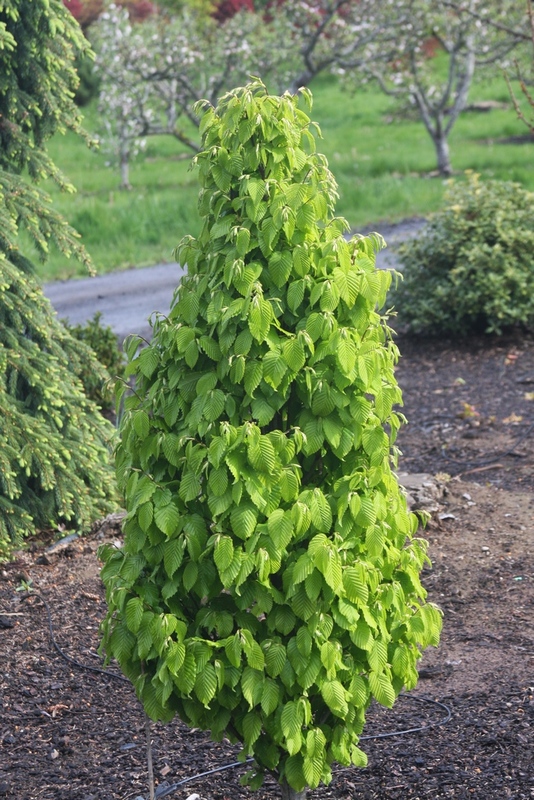 Carpinus betulus, the "Common Hornbeam," has a useful dwarf cultivar called 'Columnaris Nana'. 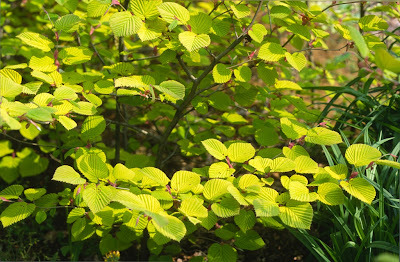 This is a delightful little tree with pretty lime-green leaves, especially in spring. I was surprised to see this dwarf at Arboretum Wespelaar last year in Belgium, which was about ten feet tall, because we're lucky to get four feet of growth in ten years. "Farges Hornbeam," Carpinus fargesii, is a dwarf deciduous tree. 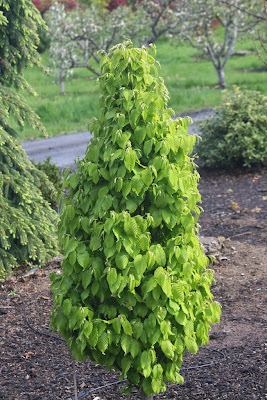 It can be attractive with hop-like fruit clusters, and I especially like the rich purple-brown new growth in spring. Edgeworthia is a genus of plants related to the daphnes. 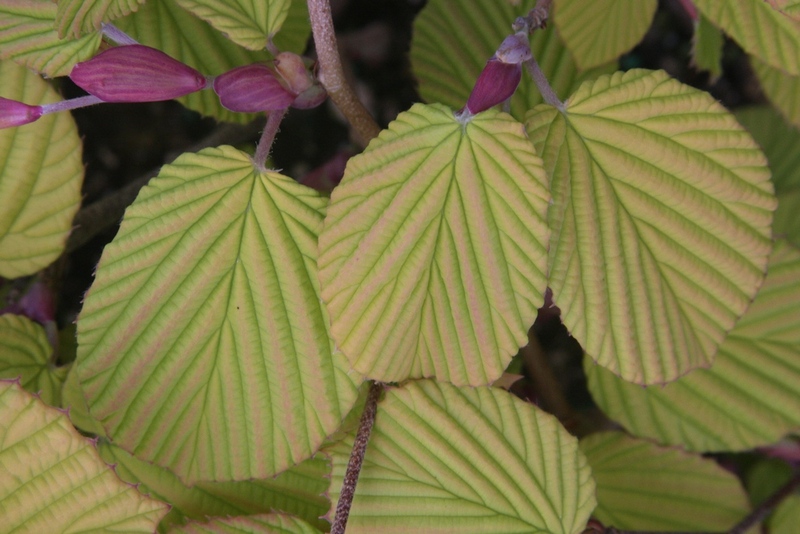 The species chrysantha is not the same as papyrifera I think, even though one or both species have been used in Japan to manufacture paper for currency. 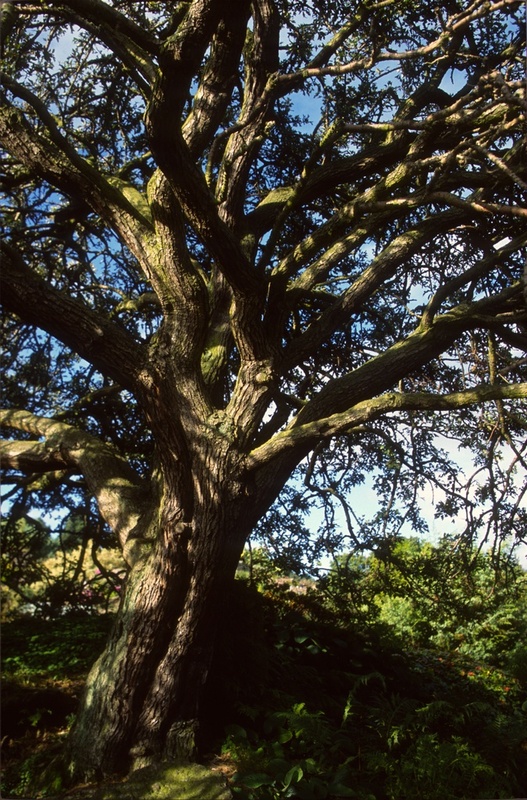 The largest tree I have ever seen was in a Nepalese pasture at 7,000 feet elevation -- it was about 12 feet tall and wide. 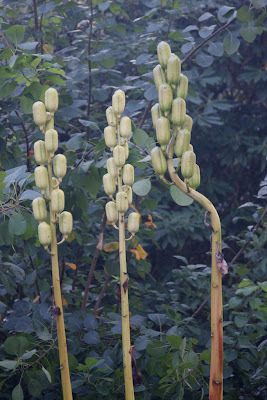 The yellow flowers were finished in June, but I can imagine the swarm of bees it would have attracted. 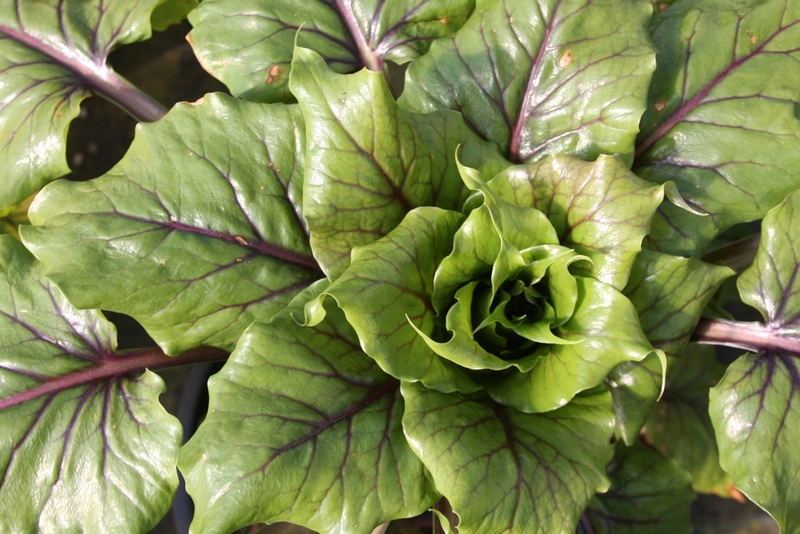 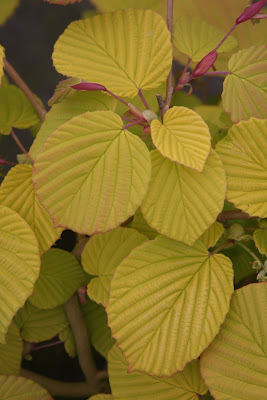 I look forward to the blooming (it will be soon in GH20) of the cultivar 'Gold Rush' which is new for me. 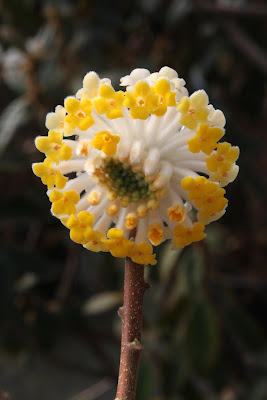 Was it selected for larger flowers, or are they more deeply yellow, or ? 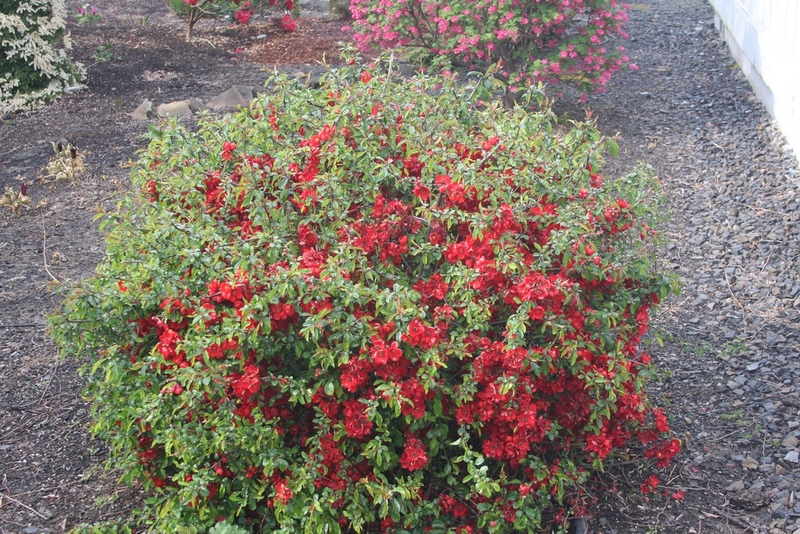 I also have 'Red Dragon' which has never shown red flowers, but 'Akabana' does feature an orange-red flower. 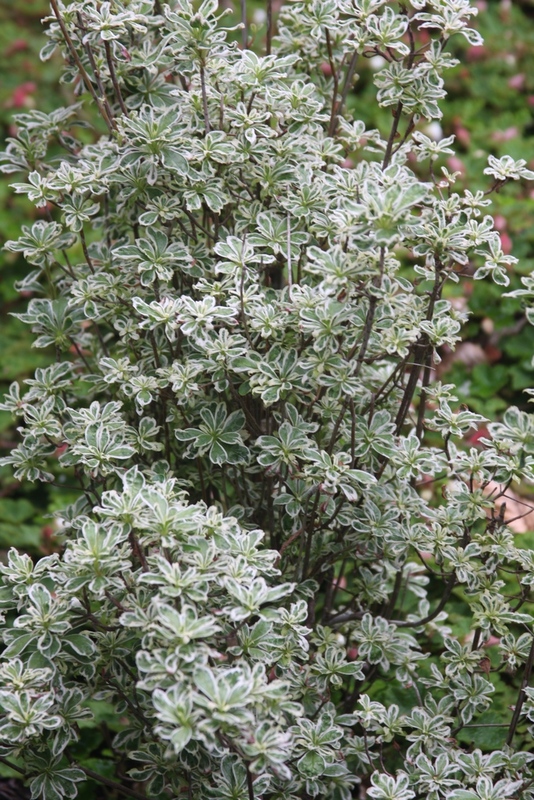 Don't be surprised if you find this plant offered as 'Akebono' instead of 'Akabana', but my Japanese wife reports that 'Akabana' is the correct meaning of the Japanese characters. 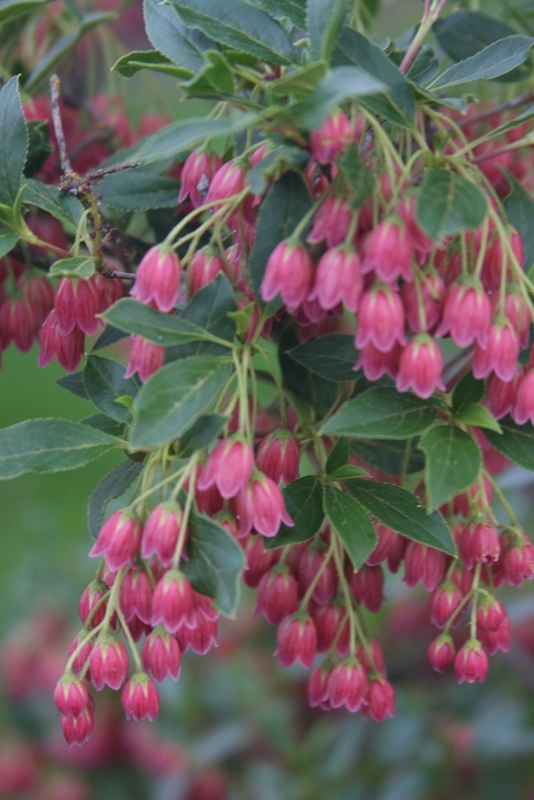 Enkianthus campanulatus is a Japanese shrub with a columnar form, and it thrives in garden settings with conditions favorable to Rhododendrons and maples. 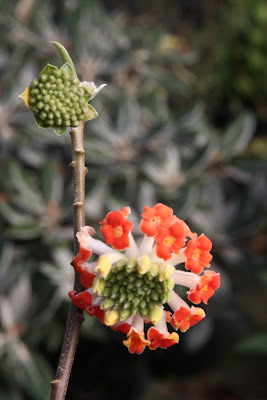 Small cup-shaped flowers droop in May with profusion. 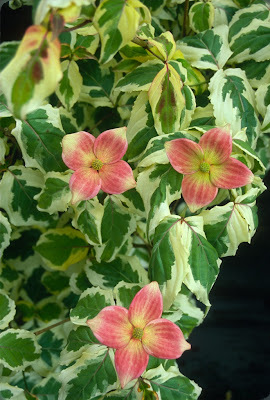 The cultivars 'Princeton Red' and 'Showy Lantern' display flowers more darkly red than the type, while 'Variegata' has small green and white variegated leaves. 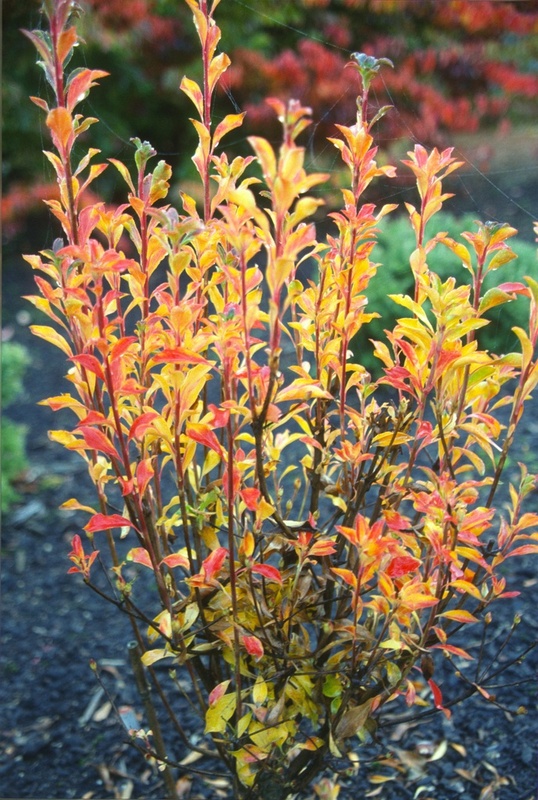 The flowers are dainty and nice, but fall color can be spectacular with yellow, orange, red and purple hues, often at the same time. Corylopsis spicata 'Golden Spring' is famous for its soft golden foliage, but before the leaves appear, fragrant racemes of drooping yellow flowers adorn this "Golden Winter Hazel." 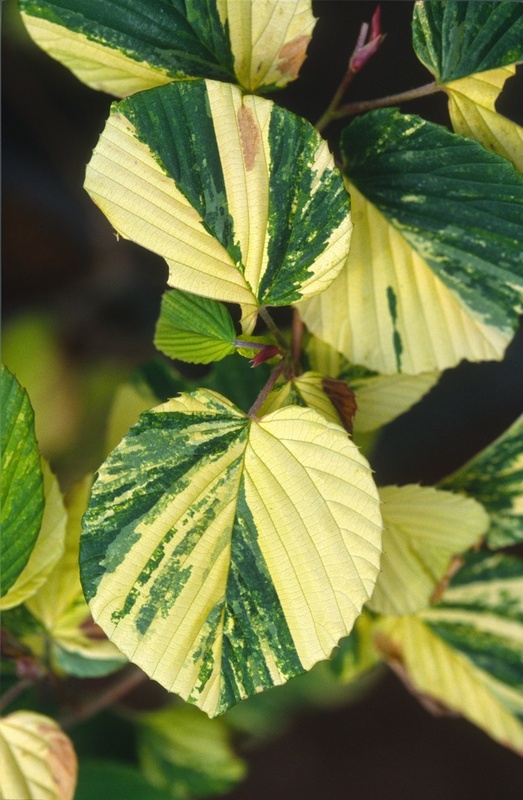 Corylopsis spicata 'Variegated' is from Japan, although it probably goes by a different name there. 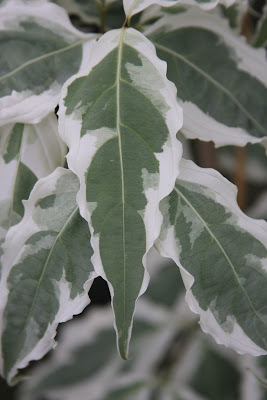 The photos above show an attractive plant, but it is totally untested by me. 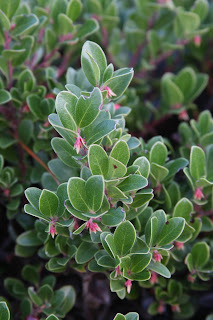 The species glaucophylla was obtained from the old Heronswood Nursery, but I can't find any further information on it. 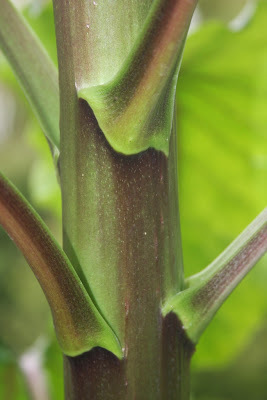 Is there really such a species? In any case the leaves are certainly very attractive. 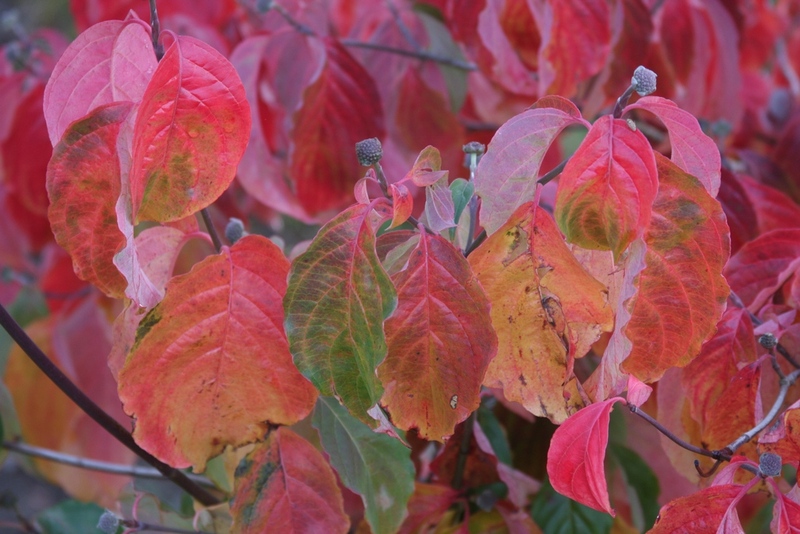 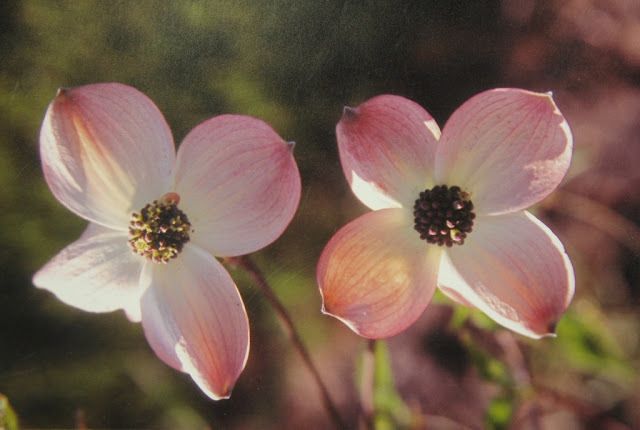 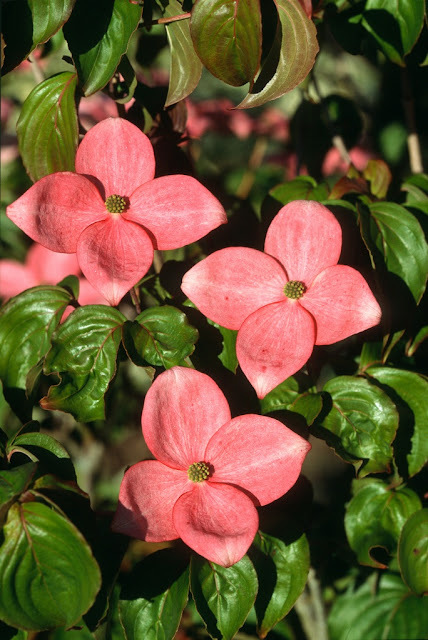 We have grown dozens of Cornus cultivars, but I'll only mention a few, and I promise not to cram our best (perhaps) -- Cornus kousa 'Summer Fun' -- down your throats. 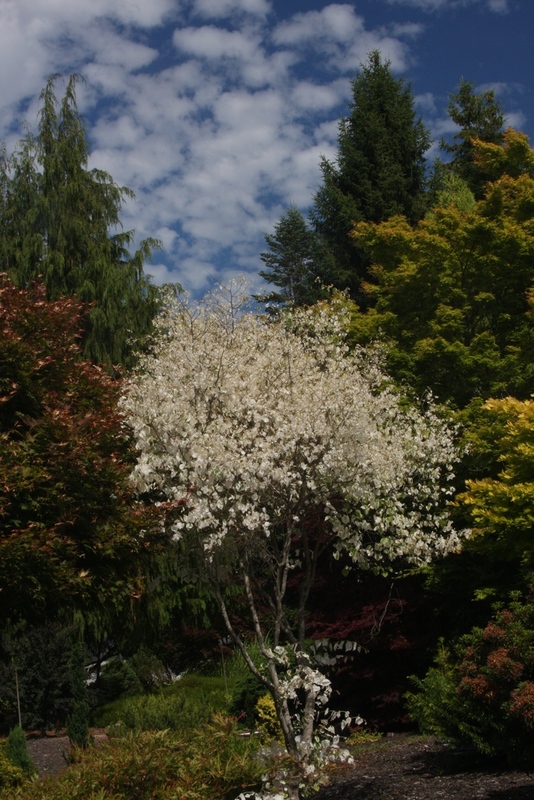 Cornus x 'Dorothy' is a naturally occurring hybrid between Cornus nuttallii and Cornus florida, found in the garden of the late Dorothy of Vancouver, Washington. 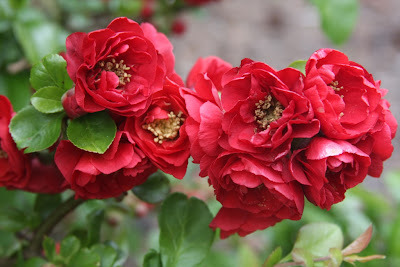 I don't remember her last name because Dorothy seemed sufficient. 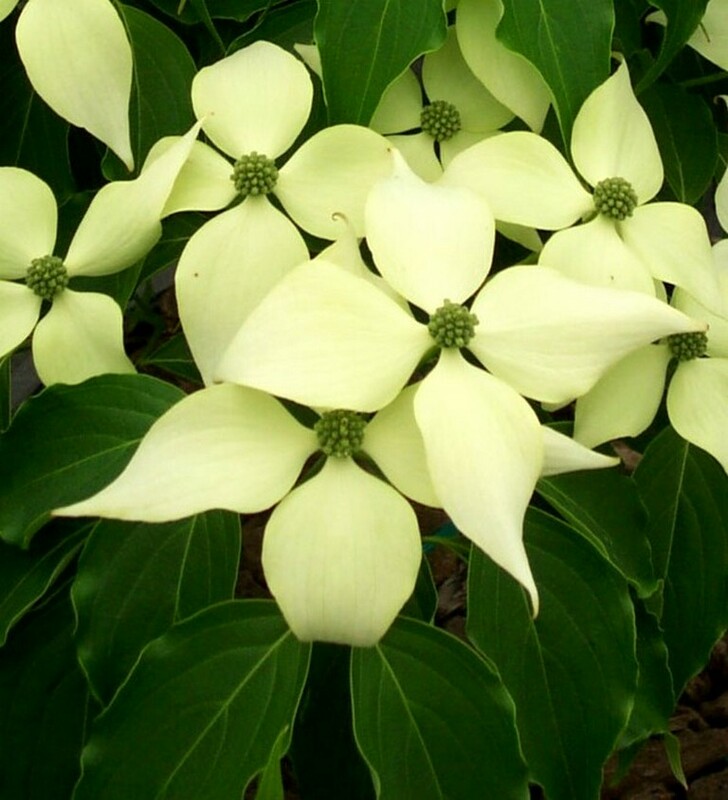 We were the first to propagate and name this sweet dogwood. 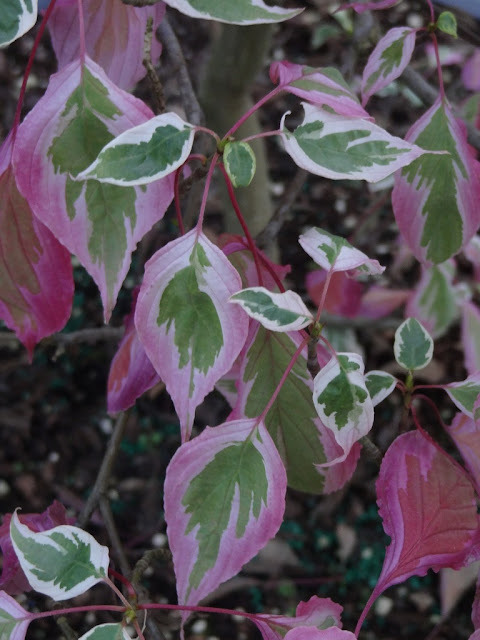 I like Cornus alternifolia 'Moonlight' -- also a Buchholz introduction -- more than the old 'Argentea' cultivar, because 'Moonlight' turns to rich shades of purple in September. 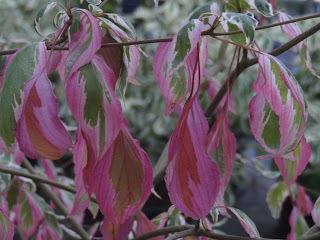 Just now turning purple is the late-to-defoliate Cornus sanguinea 'Compressa', a compact pyramidal shrub with curiously crinkled overlapping leaves. I'll mention three Cornus kousas: 'Akatsuki', 'Big Apple' and 'Heart Throb', not that these are necessarily my favorites. 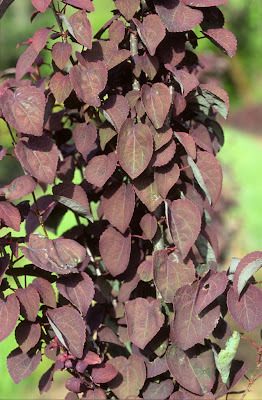 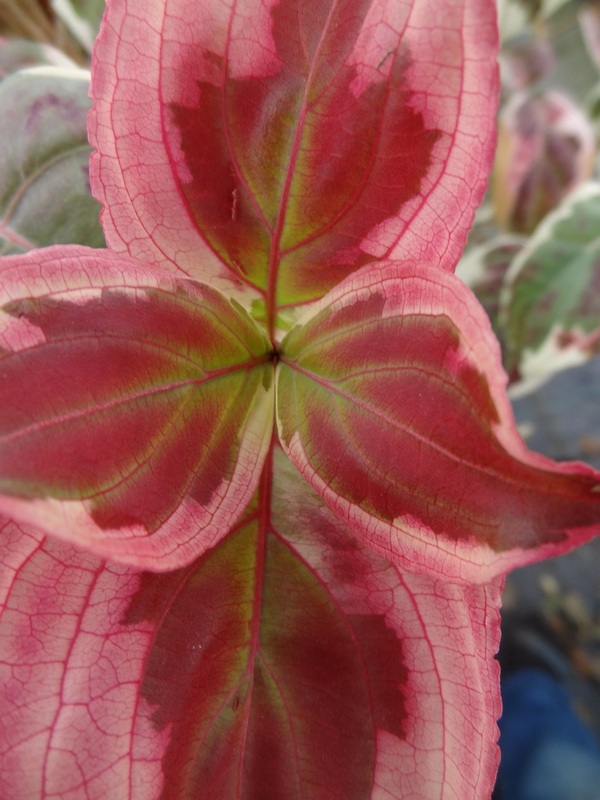 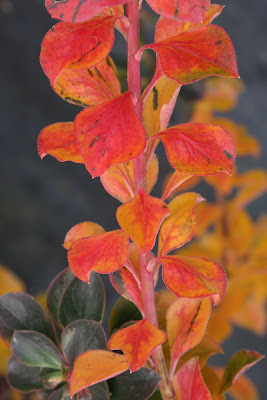 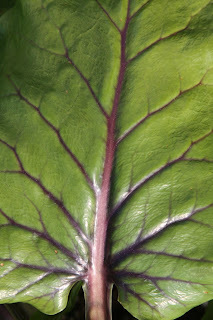 'Akatsuki' can have bracts that are deep pink-red, or in other years only spotted red. 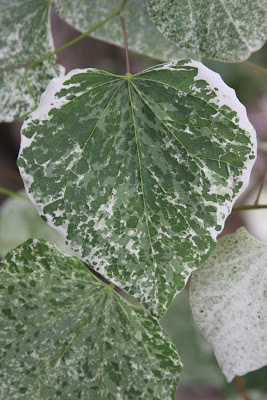 Leaves are variegated green and white, but not as spectacularly as 'Summer Fun'. Oh what the heck, I guess I will cram more 'Summer Fun' photos down your throats. 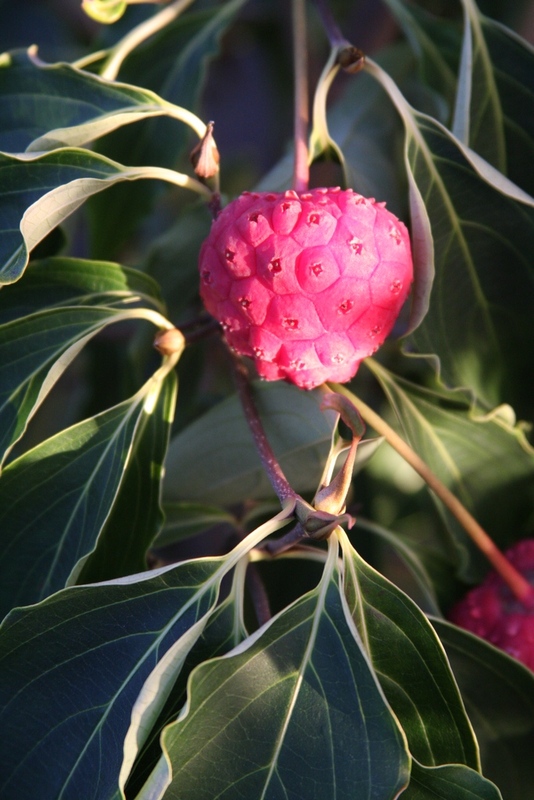 'Big Apple' displays very large fruits in fall, I think the largest on any kousa cultivar, while in spring you get nice, but normal, white flower bracts. 'Heart Throb' is the late Jim Schmidt's patented tree...with dependably vibrant pink-red flowers. 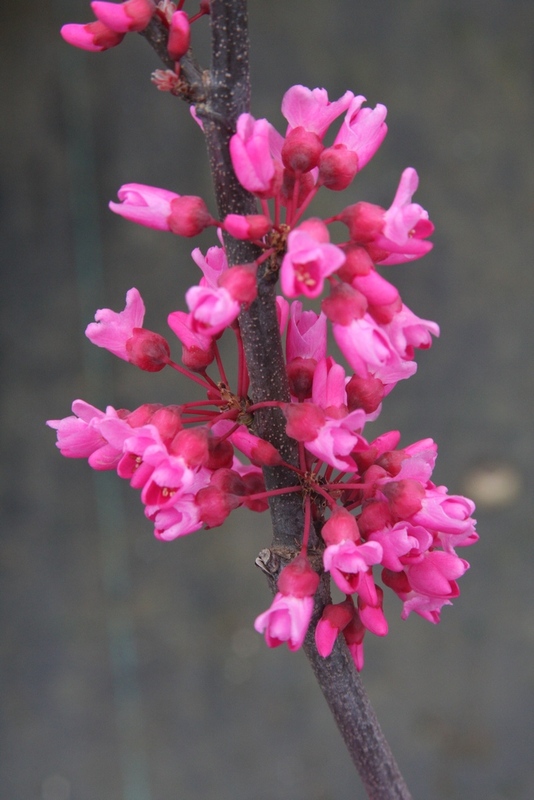 Some years they are more red than pink, a factor of light intensity that particular spring. 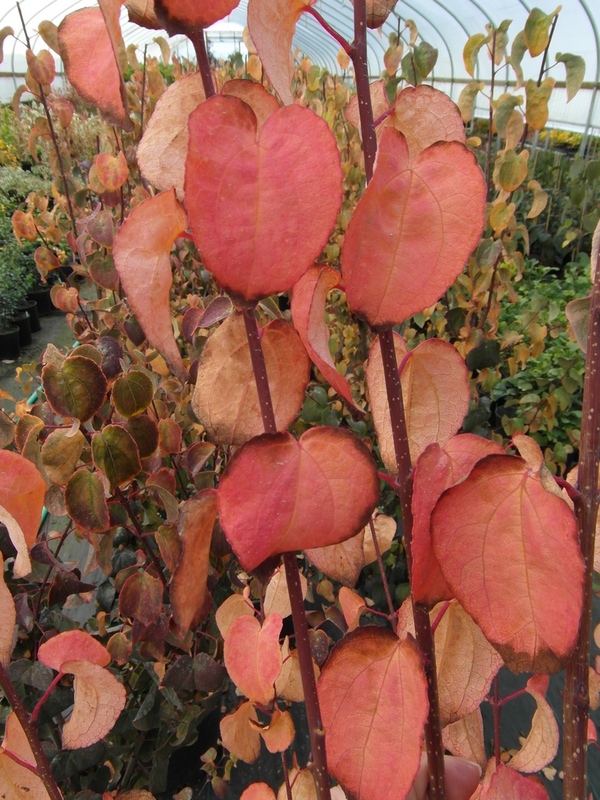 We grow a couple of ornamental "Quince" cultivars which are probably hybrids x superba (japonica x speciosa). 'Dragon's Blood' has intensely red flowers, usually on bare branches. 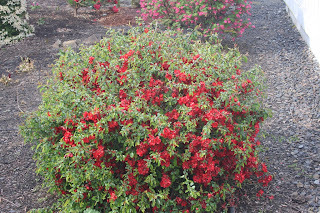 'Crimson and Gold' is also very red, and it is set apart by golden anthers, a nice combination. 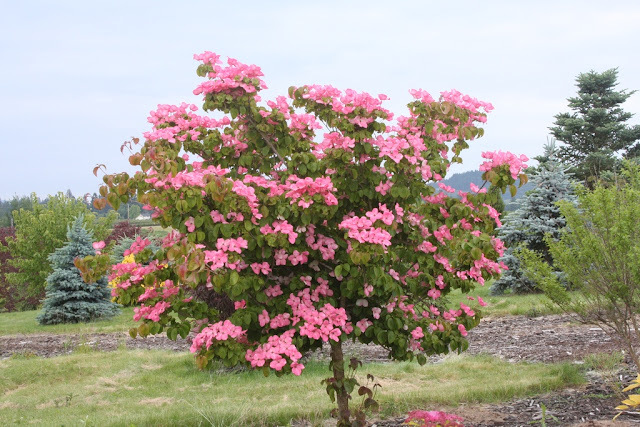 It bloomed for a long period this past spring, even as the leaves began to emerge. Chaenomeles can be mean plants, though, with wicked thorns that make pruning no fun task. 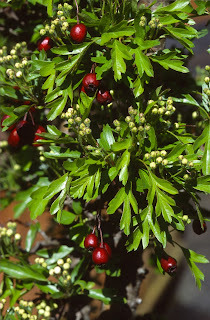 Crataegus monogyna is the "Common Hawthorn." The cultivar 'Inermis Compact' refers to the fact that it is a compact tree, and that it is not armed with thorns. In Oregon it is a fantastic tree with no diseases or problems in my experience. 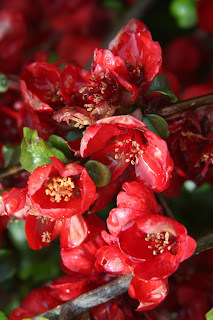 Pretty white flowers in spring are pleasantly fragrant, and the red fruits in fall and winter attract birds for months. 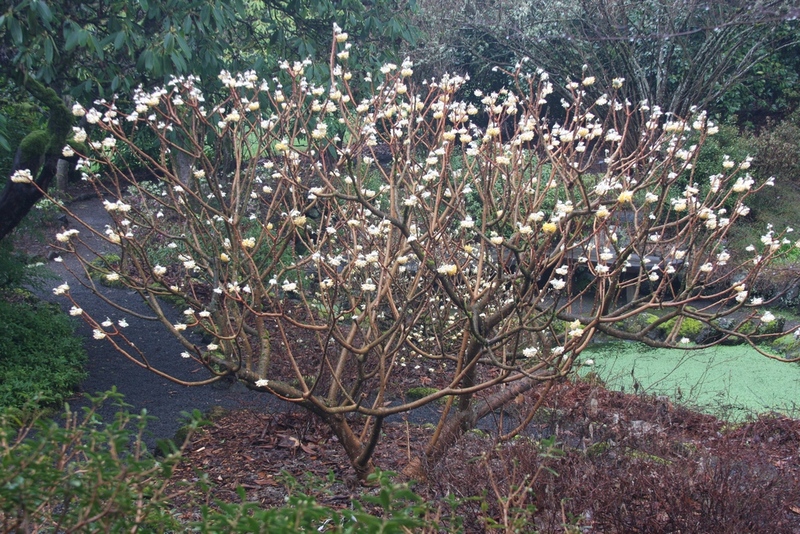 In winter the garden benefits with its stout muscular branch structure. It can get large with age, as you can see from the photo of the old specimen in the RBG Edinburgh's rock garden. 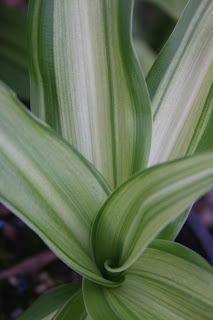 I've been growing Crinum species for a number of years, and recently acquired moorei 'Variegata'. 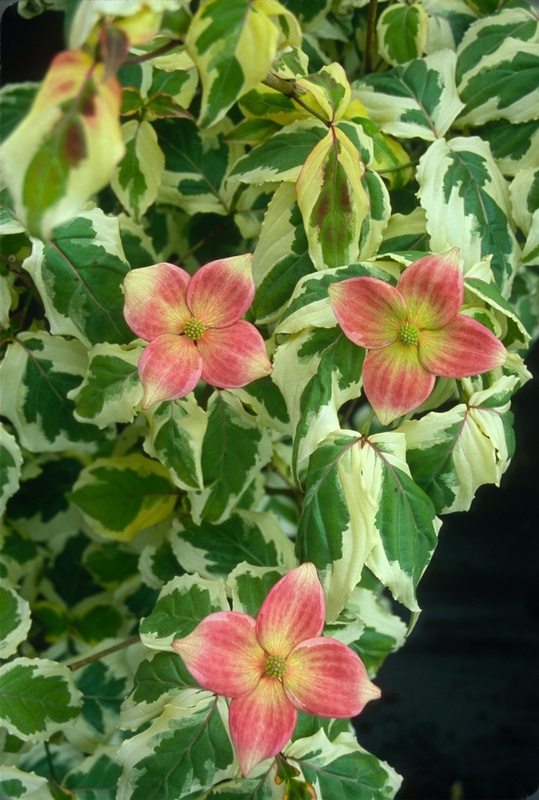 Flowers are cream white with just a hint of pink, but the variegated foliage is absolutely spectacular. 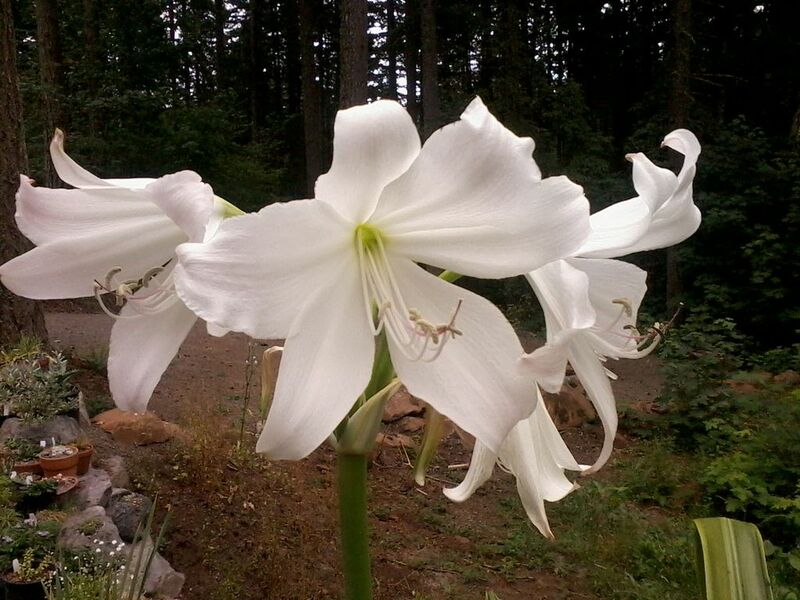 Moorei is a South African species hardy to only USDA zone 8, but if your climate is mild enough, this "Bush Lily" is a must. 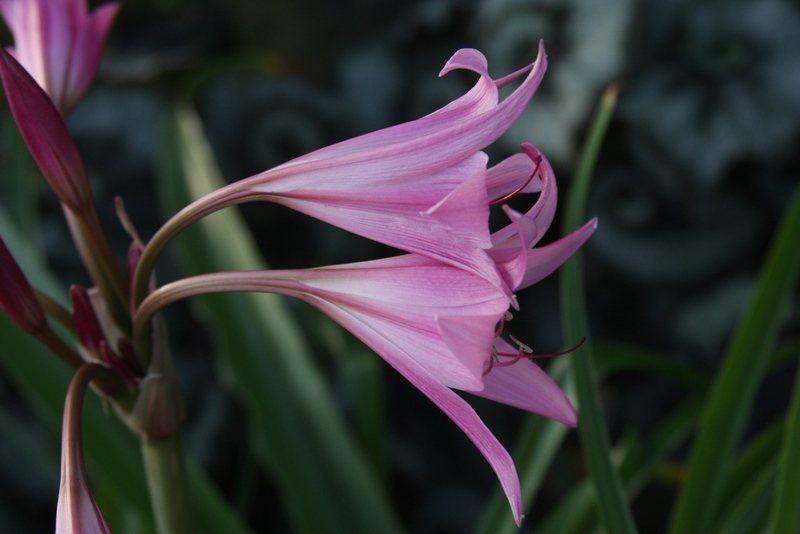 Crinum x powellii is the "Cape Lily," a hybrid between bulbispermum and moorei. There are white-blooming cultivars as well as the lovely soft pink forms. Reference books suggest that Crinum x powellii is hardy to USDA zone 6, and that's great, but keep the damn slugs off the blooms. 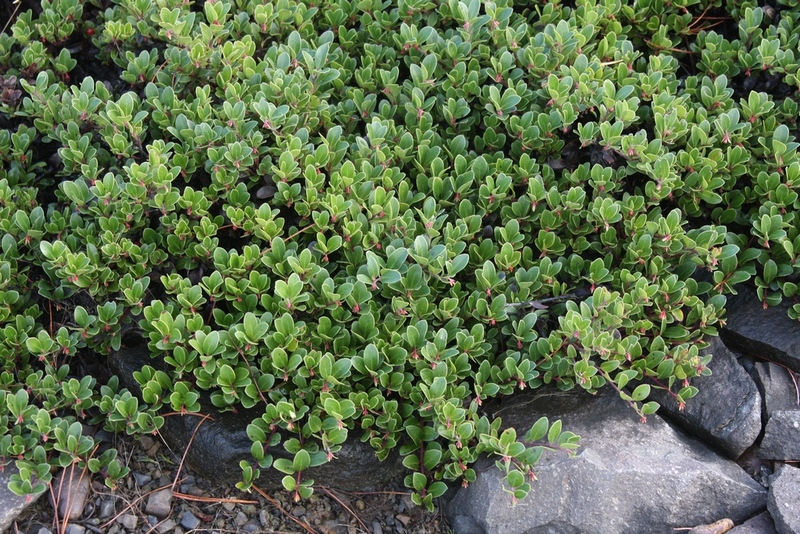 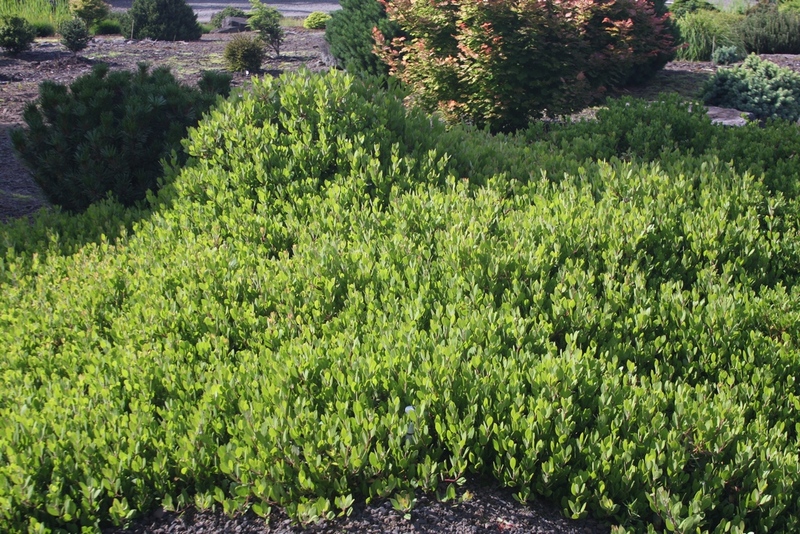 Arctostaphylos is a genus of evergreen groundcovers or small trees. 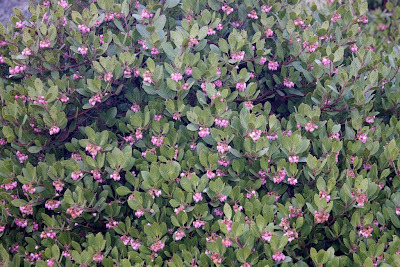 The species nevadensis is found mainly in California despite its name. 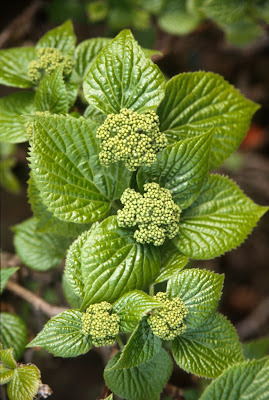 We grow two vigorous cultivars in our large rock garden, 'Ponchito' and 'Cascade', and they look like naturally occurring spreaders. 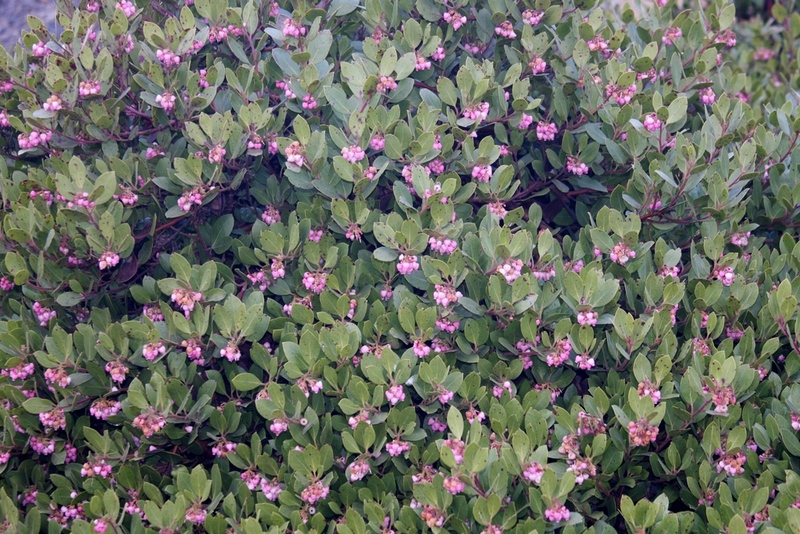 Small pink flowers adorn these two specimens, both of which are about 8' wide after 15 years. 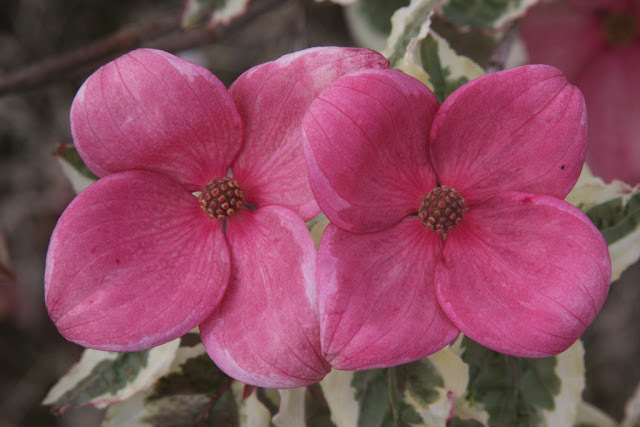 These two cultivars are fairly similar, with the leaves of 'Ponchito' slightly smaller. 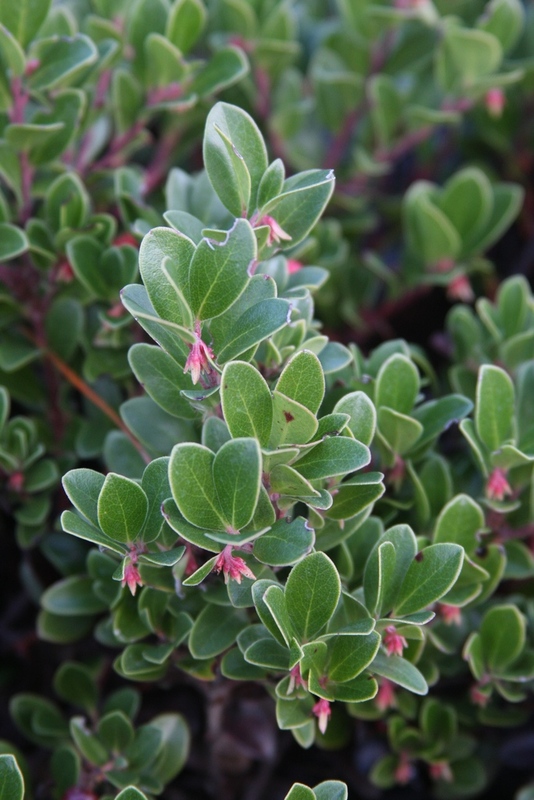 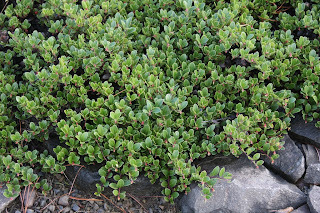 Arctostaphylos uva-ursi is the "Red Bearberry" and we have a couple of nice patches of the cultivar 'Radiant', and they are much lower growing than the nevadensis. 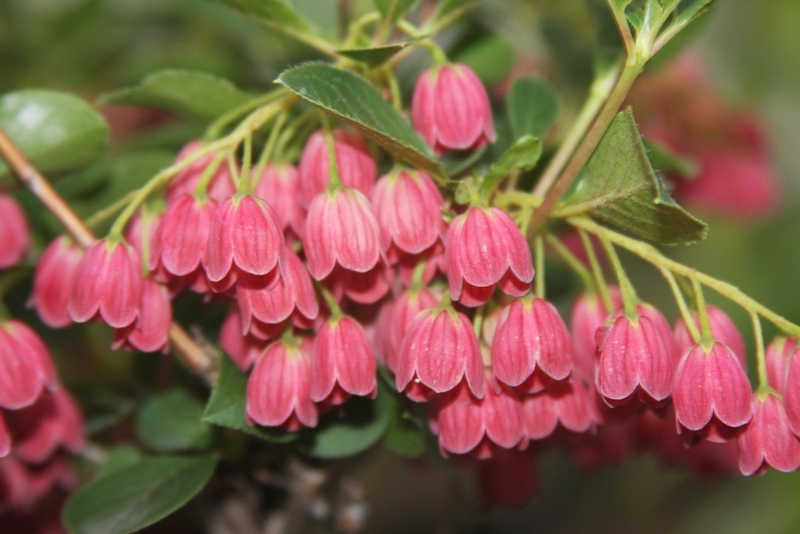 Flowers are white with a little pink, and the berries are radiantly red. 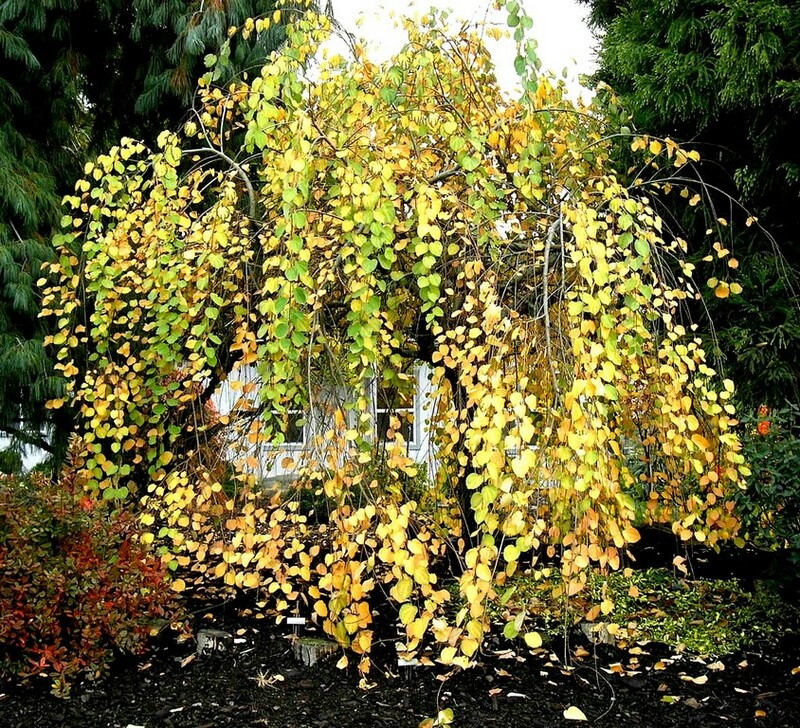 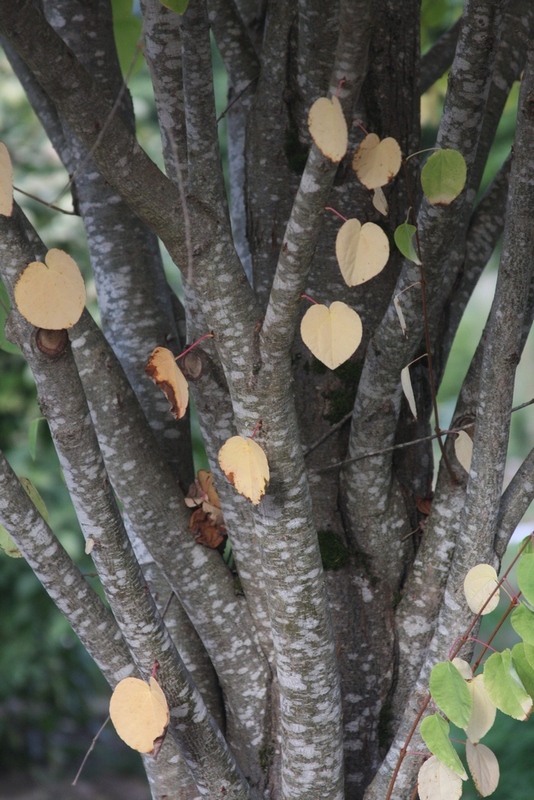 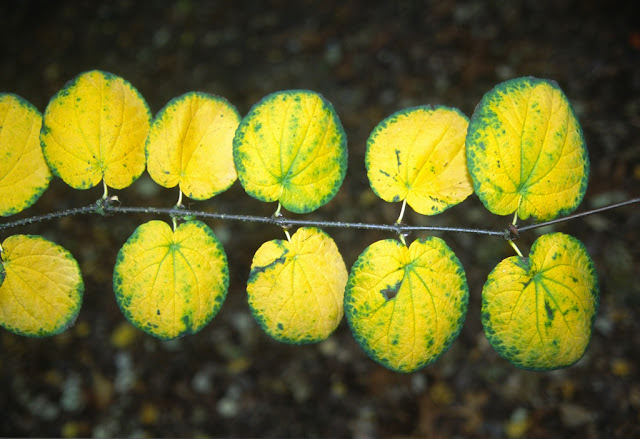 The Japanese Cercidiphyllum japonicum, or "Katsura," forms a medium-size tree with small round leaves. 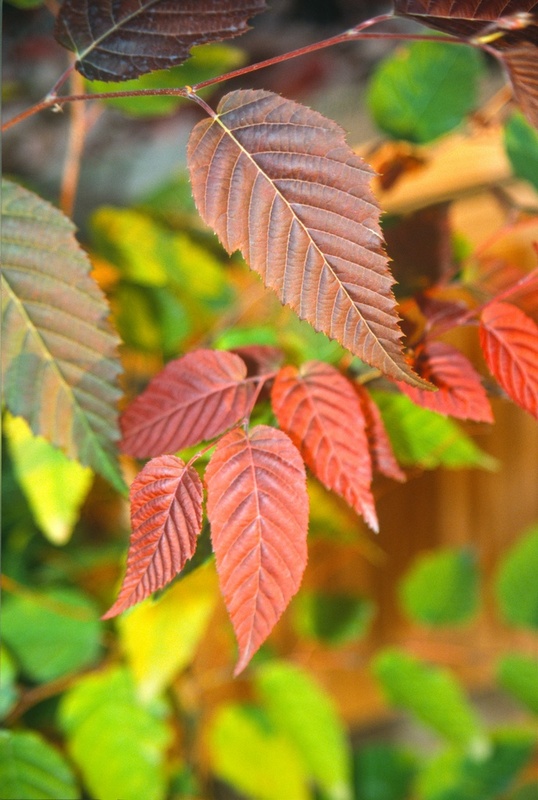 Autumn color ranges between yellow to pink, and as the leaves fall, one can easily detect a sweet pleasant odor. 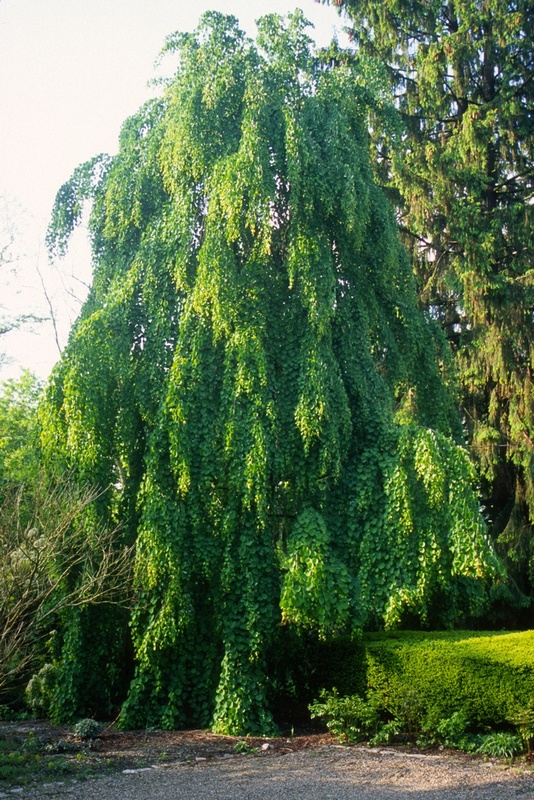 The selection 'Pendula' is of course weeping, and with age can grow to thirty or forty feet tall. 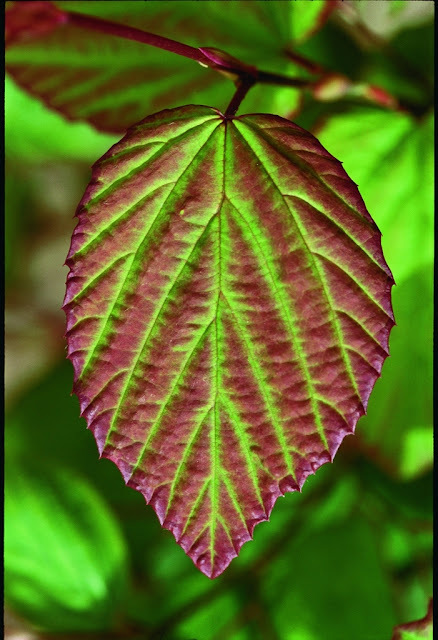 'Raspberry' has leaves that emerge with red color in spring, then evolve to green by early summer. 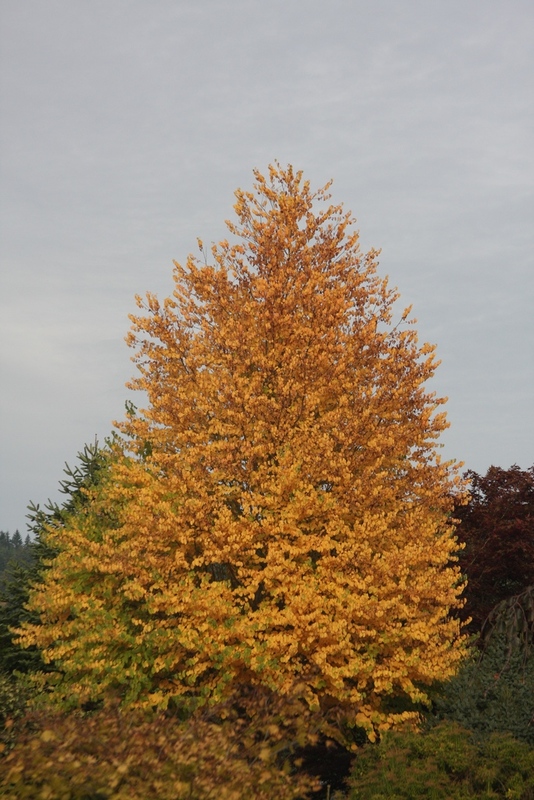 For us, fall color is usually yellow. 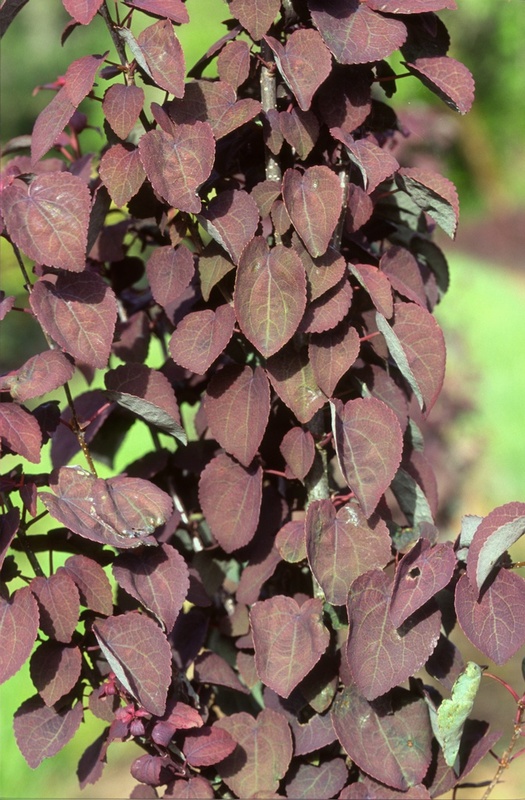 'Red Fox' (or 'Rot Fuchs' in Europe) displays purple red leaves throughout most of the summer. Cercidiphyllum magnificum is also from Japan and features leaves slightly larger than the japonicums. 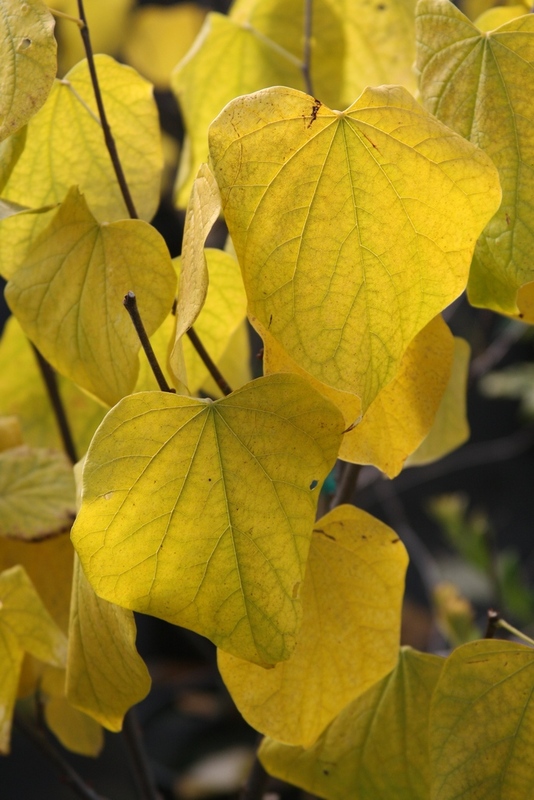 The genus Cercis also has round leaves, as the name implies, and the species canadensis is known as "Redbud." 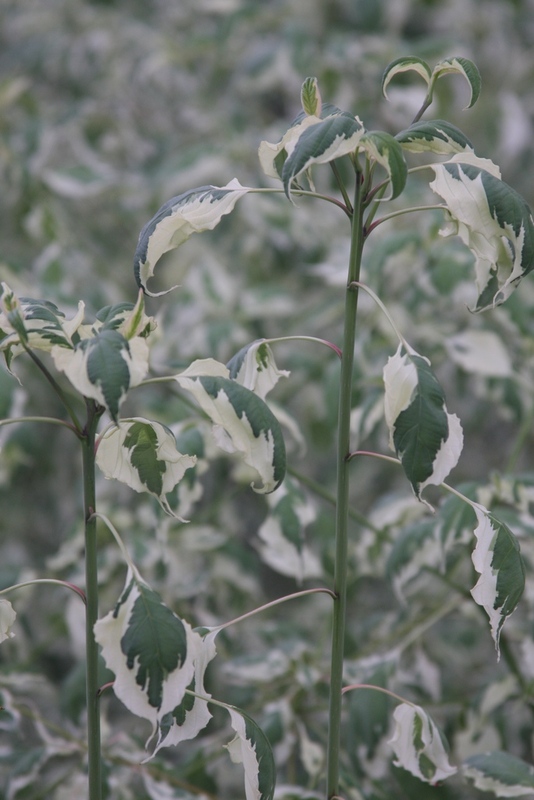 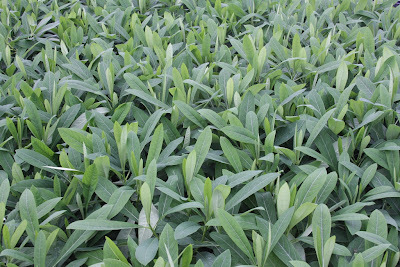 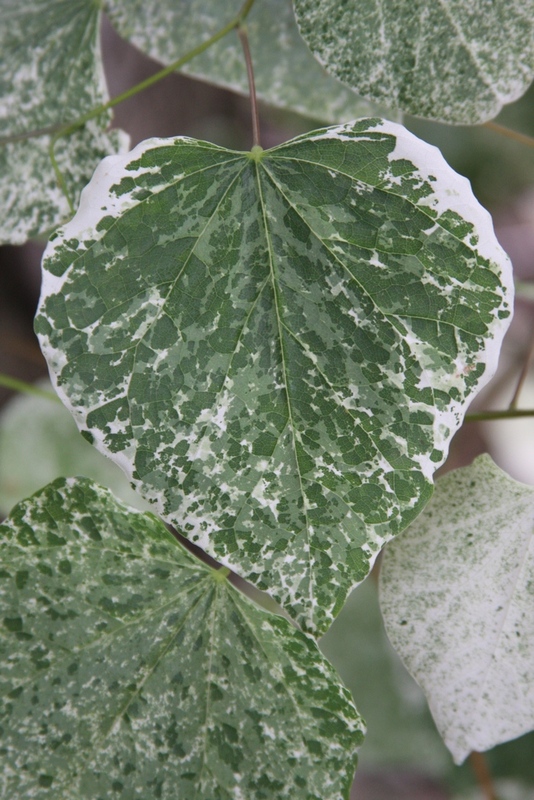 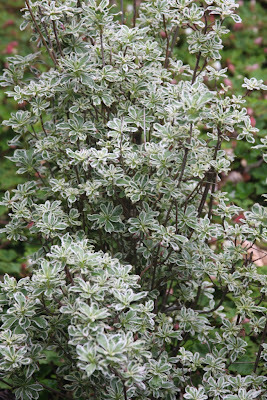 'Silver Cloud' has wonderful white-green variegation, and will not burn when established. 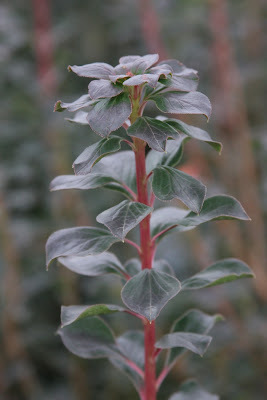 They are not so easy to propagate unfortunately. 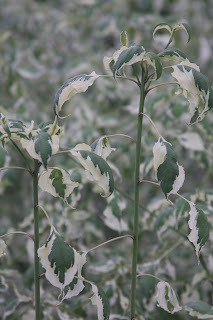 'Appalachia' displays metallic rose flowers in March; and I once saw the cultivar 'Aurea' with yellow leaves in summer, but I don't grow it. I suppose that is enough of "everything else" plants for now, but there could have been a thousand more. 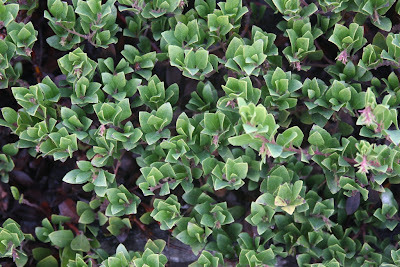 I love the way that one can travel around the globe with plants, indeed a world trip is even possible in a modest-sized landscape. So today we have travelled to the world's "best corners," as well as to the brutal Antarctic, and we have all done it sitting in our chairs. 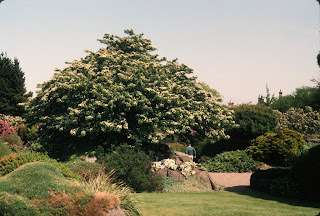 Owner of Flora Wonder Arboretum and Buchholz & Buchholz Nursery in Oregon.